In this second installment, Kate reluctantly agrees to do a favor for the local Pack and investigate the disappearance of some valuable maps. While hunting down the culprit, Kate gets called in on another favor. This time she winds up shackled with a teenage street urchin whose mother recently joined an amateur witch coven and went missing shortly after. Kate promises to find the girl's mother and, in the process, is caught in the crossfire between two ancient deities vying for power. So pretty much an average day for Kate and the city of Atlanta. 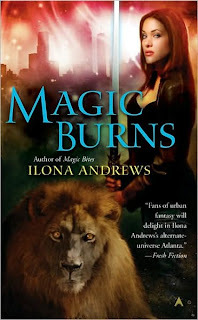 The highlights of Magic Burns are definitely the increased personal interactions between Kate and the various people and creatures who've come into her life. The growing attachment between Kate and Julie (the young girl in her care) develops quickly and the protective stance Kate takes throughout the course of the book is quite touching . Equally compelling is the more slowly developing connection between Curran, the Pack alpha, and Kate. Despite their mutual attempts to avoid each other. The reader gains several insights into these two almost painfully private people and the ending promises more good things to come. In fact, these quiet character-driven scenes were so interesting that I wished there were just a few more. The plentiful action and fighting sequences seem to always take center stage and, though we do get a little more information on Kate's background, it is a very little and I am (of course) anxious for more. A solid second book, I'm looking forward to the third one, due out sometime next year. I'm at odds with this book. I love it but the Andrew's team is killing me with suspense as I wait for the Curran/Kate relationship to unfold. Lol. I know what you mean. They certainly enjoy taking their time, don't they? I think the anticipation is part of the lure. Most definitely. Particularly with Curran, I can't tell what he's thinking. Thanks for the review mentions too! No problem, Kimberly. I love your reviews.